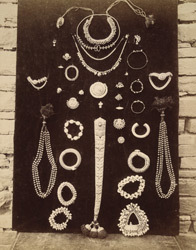 Photograph of an arrangement of temple jewellery from the Ramalingeshvara Temple at Tadpatri, Anantapur District, from the Archaeological Survey of India Collection: Madras, 1896-98. This complex was built during the Vijayanagara period at the beginning of the 16th century. It is entered through large unfinished gopuras and consists of two temples situated in a courtyard. The incomplete gopuras are covered of extremely elaborate carvings in the Vijayanagara style. This photograph shows a part of the vast amounts of jewellery the temple received as donations from devotees. These were placed on temple idols on special occasions such as religious festivals.